Here are a few warnings before you hit the play button on Songs From Another Blue Planet: 1) Do not go for a swim until at least one hour after listening. 2) Avoid using scissors while this music is playing. 3) If free jazz causes you hives, have plenty of calamine lotion on hand. I am on the record as not being the biggest fan of spontaneous creation, which most of Songs From Another Blue Planet is. Sometimes, however you come across something in this genre which sounds like the musicians really know what they are doing- or not doing. Such is the case with this project led by the fine bassist Antonio Quijano. There are enough nods to form, melody, direction and some serious infectious grooves between the searching, that there is something to like for most jazz and fusion fans. Reed player Paul Dunmall, guitarist Philip Gibbs and drummer Marco Anderson have been playing in this mode with each other for years. 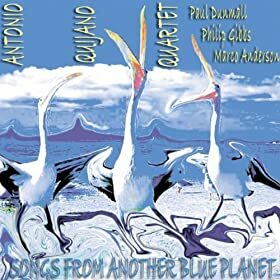 In fact, half of this album, initially consisted of just that trio when Quijano could not make the first recording session. He added his parts afterward, enhancing even further the romantic notion these players have of on the spot creation. Truthfully, though, his bass lines often supply, at the very least if not more, the elements of some structure that help act as an adhesive for many of the forays. This is one very talented chap whose outstanding and creative solos betray the talents of a player deserving of much more attention. Drummer Anderson’s invention, and role as the rhythm partner with Quijano from time to time, is a maintaining of the high standards he has established in his own bands, including The Bird Architects, and in many recordings, especially his world fusion music sessions with the renowned Surinder Sandhu. The two best cuts on Songs From Another Planet are the semi-ethnic “Yodalele” and the beautiful “Recuedas de las Memorias Perdidas.” The opening cut, "Introducing... And Not Forgetting" and its Medeski, Martin and Wood-like vamps can easily take the place of one of the two, depending upon weather conditions. The album is too long by 2 cuts. I suggest you save the extra tunes and use them to start your next morning instead of a cold splash of ice water to the face. They should brace you for the day’s BS.